According to a report from Spanish publication Diario de Cadiz, New York City FC may be pursuing Spanish midfielder José Mari. The report cites a good run of form for Mari this season, his second in Spain since leaving the Colorado Rapids at the end of the 2014 season. The defensive midfielder has played in 25 league matches so far this year (22 starts) as well as one Copa del Rey start against Córdoba, a 2-1 third round loss that ended the Segunda club’s cup run. Though Cádiz CF play in the Spanish second division, Mari is not without experience in a top-tier division. 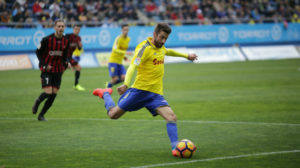 Having played with both Real Zaragoza and Levante (though the latter was relegated in his last season with the club), the 29-year-old has a combined 64 appearances in La Liga to his credit. Though the report contains no direct quotes or attributions, Mari’s addition to the club wouldn’t be entirely out of line. The man currently in that defensive midfield role – Yangel Herrera – is only here on loan from Manchester City. With his seemingly-imminent departure at the end of the season, combined with the presumed retirement of Andrea Pirlo, NYCFC will need to replenish their midfield with skilled players. Mari’s contract with Cádiz CF is set to expire at the end of La Liga’s season next month. He would be available as a free transfer.